Your local friendly music shop, on line or through specialist harp suppliers (see below). eBay isn’t recommended in this instance as you just don’t know what you’re gonna get or where it’s been! Music shops are the obvious first choice, however in my experience very few know much about harmonicas. OK you can actually see the harp you want, but what happens if it’s out of tune (with regular pitch or with itself), has a duff reed or just isn’t fit for purpose. Believe me it happens. If you pay up front and try the harp out before you leave the store (no room for being bashful here), will they exchange it if the harp is out of whack? Or will they tell you either you’re not playing it right, you’ve just broken it, or you need to send it back to the manufacturer… Or best still – at a music store in Brighton specialising in guitars – ‘harps don’t go out of tune.’ REALITY CHECK! Before buying any harmonica, check out the retailer’s ‘returns’ policy. Standard procedure in a music store used to be: pay for the instrument upfront, play it before you leave the premises and exchange any faulty goods on site. If the harp you’re buying is audibly out of tune or sub-spec, does not octave free of any tremolo effect, is not airtight, does not bend correctly or rattles when played – it should be exchanged for another unit. Retailers used to be happy with this. Heads up if buying inside the USA. They’ll tell you that ‘State Law says’ you can’t blow a harmonica and then return it – on health and safety grounds. You must return any defect merchandise to the manufacturer…at your own cost. Hello. Contract with the retailer? They go deaf on you and start serving another punter. Believe me I’ve tried this in New York and San Francisco. No way will they let you blow that thing to check if it’s fit for purpose… And harps are half the UK price over there… Anyway I’ve flagged it up. If you have any feedback pleased get back to me. So how do you obviate the apparent ignorance shared by high street retailers or the risk of purchasing a dodgy instrument you need to place between your lips? The short answer is work with people who understand your needs. Of all the on-line distributors, I recommend Harmonicas Direct. They provide an informed, friendly, fast and personal service. I spoke to Peter at HD about all of the above and I can assure you he is on our side! Scroll to the foot of HD home page and select Technical. The returns policy is very clear and more than fair. For that little bit of personal extra, I totally recommend West Weston’s customised harps. For £35 plus postage you receive an original spec Marine Band which West will check and calibrate before he sends it out. Any problems and he’s only a call away. His harps have the juiciest sound and you don’t have to pump ’em hard. Great for tongue blocking. For an insight into ‘the dark side’….check out my experience with Haight-Ashbury Music in San Francisco. Later repeated on Tin Pan Alley off Times Square in New York. There are so many types of harmonica on offer it can be bewildering at first. Without a doubt you need to start with a standard 10 hole diatonic (commonly called a blues style harmonica or short harp). THis is what the majority of players use for blues, rock, country, folk and celtic. The bulk of non-chromatic reference material is built round this type of harp. It’s going to take time to learn any harp at first, so at this stage the brand is not too important. They’ll all present you with the same obstacles as a beginner. Later on you can try different makes and models and begin to establish your favourites. Ultimately it’s down to personal taste. One man’s tin sandwich is another man’s gob iron. Most retailers will stock Lee Oskars or Hohners. These are fine. Wooden bodied, plastic or alloy? I play both. Arguably wooden bodies give a warmer tone. Occasionally they need a little breaking in from new. Then again alloy combs ring out. Plastic and alloy are more durable and won’t swell if they get damp. Currently I favour Hohner Marine Bands (wooden body) from West Weston and Hohner Big Rivers (plastic body) from the high street. I’ve used Herring before (plastic) – they were lovely and rich. I also had an alloy valved Suzuki once which sang out beautifully. The main brands are Hohner, Seydel Söhne, Lee Oskar, Herring, Bushman, Huang, Tombo and Suzuki. 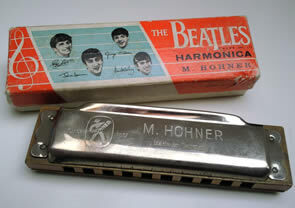 The oldest and largest of these was the Hohner company until Seydel Söhne was resurrected. Hohner produce a whole range of diatonic harps, which you wil find in most music stores or through mail order. Their wooden bodied varieties include the famous Marine Band. There is also the Blues Harp. Plastic bodied harps include the Special 20, Pro Harp, Cross Harp and Big River Harp. Hohner recently shifted their manufacturing plant from Germany to China, and quality has suffered somewhat. However they still offer a good full tone and reliability. The Marine Band can be prone to air seepage between the body and the cover plates making the harp harder to play, but go to West Weston and he’ll sort this out for you. Another common brand of harp is the Lee Oskar made by Tombo in Japan who also produce good diatonics like the Folk/Blues and the Ultimo. Lee Oskars are really popular because they are airtight and ready to play. Their tone is not as full as a Hohner, but they are great performance instruments. You can venture into all types of tuning too and replace reed plates cheaply and easily. The other makes of harp are perhaps less common although the Huang Silvertone Deluxe and Star Performer are widely available at the lower price end of the market. Don’t be put off by the low price tag; they are in fact very good value for money and make excellent practise harps. I would recommend these for anyone on a budget. Which key should I start with? 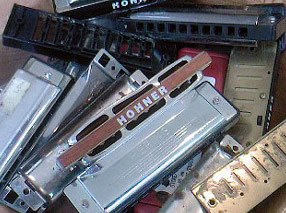 Diatonic harmonicas are tuned to the key stamped on the cover plate or on the end of the comb. This is straight harp or 1st Position. It means if you buy a Harp in the key of C major you’ll be playing in the key of C major. With time and practice you will be able to switch to 2nd position (also known as cross harp or blues harp). C harps played in 2nd position will open up the key of G for you. Then there’s 3rd position – D minor and… Don’t panic. It will soon become clear. You’re just learning a new language! Which to key start with? Definitely a C. It’s mid-range and most tutorial books use a C harp. Once you into blow bending, you’ll need something a bit lower like and A or Bb. You’ll certainly need A and D if you want to play along with guitarists. Then there’s F at the high end of things…unless you want to try Low F, Low A. But let’s not muddy the waters too much. But a C harp, buy a tutorial book, phone a friend, ask the audience, then come to me for a lesson. Do you recommend any tutorial books? Yes! Anything from Dave Barrett‘s range of books. Sign up for his free bi-monthly newsletter on-line too at HarmonicaMasterclass.com. Also Blues Harp from Scratch by Mick Kinsella is an exellent module for beginners – one or two typos in the tab, but the structure is superb and gets you off into very good habits from the start. Then again you have endless material on-line at You Tube – Jason Ricci and Adam Gussow have been amongst the most prolific and well-regarded contributors. If you have time or can’t sleep, pour yourself a pint, grab a harp and prepare to be dazzled! But beware – they can become addictive! (The lessons on line and the pints that is). And finally Steve Baker. Anything instructional by Steve is worth every penny. His Blues Harmonica Playalongs Vol. 1 is a seminal work – Double Crossed and Blue has to be one of the all time perfect examples of 3rd position harpooning.